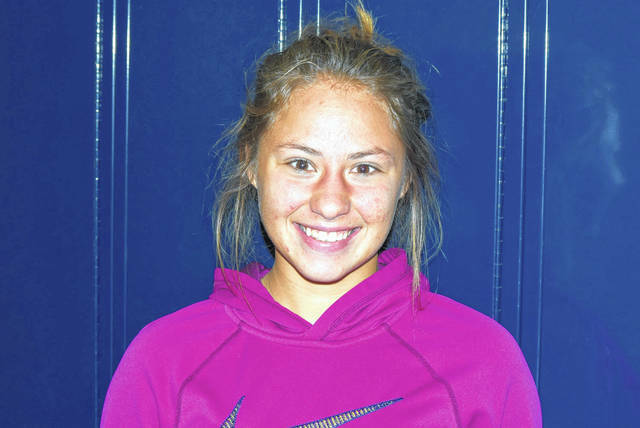 ST. MARYS — Aliya Patterson, 17, a senior at St. Marys Memorial High School, has seen her share of schools but came back to St. Marys. “This is actually my third high school that I have been to in four years. I was originally from St. Marys, and then [in] my 5th-grade year, I went over the Wapak. I was at Wapak my 5th through 7th-grade year, and then my 8th grade and my freshman year, I moved down to a school in southern Ohio named Westfall [in] Williamsport. My sophomore year, I moved to another school called Madison Plains, down in southern Ohio. It’s in London. Then my junior year, I moved back up here,” she said. Patterson is getting plenty of leadership and business experience while at St. Marys. “I’m very active in two different business organizations. One is DECA, which we have here. I got involved in that last year. The other is Business Professionals of America, or BPA. We are a career technical student organization, and I am both a state and national officer for BPA, I just got elected into the national officer team in May and I got elected to the state officer team last November,” she said. She is involved in the College Credit Plus program, where all of her classes are at the Wright State Lake Campus. She hopes to someday be a surgeon. “I would like to become a cardiothoracic surgeon with a specialty in either gene mapping or fetal surgery,” she said. But she had considered another career choice. “I kind of switched gears a little bit. I wanted to be a surgeon for a big part of my life. Then once I got really involved in BPA and got elected into my national officer positions I got a few really large scholarships and decided that business was going to be the way that I went. Well, after I committed to my first college I felt like I was settling and that I really wanted to challenge myself and really go out and help people and so I went back to my surgical path and so I am pursuing my license in phlebotomy. They make pretty decent money for somebody straight out of high school and it will help pay for my college as I continue. It will give me really good hands-on experience. It’s been a big goal of mine for a big portion of my life, except for a small area this year. I’m really passionate about helping others. I want to think I can really do that and utilize my skill set in that situation,” she said.